Taste test: Very good salt & vinegar taste, they taste like Cape Cod salt & vinegar, but still not as good as the s&v champion. The major negative was that there were barely any chips in the bag. 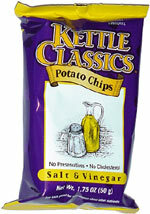 Kettle Classics potato chips bags seem to be on average two-thirds or more empty.